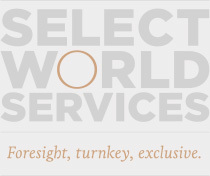 Select World Services Srl operates http://www.SelectWorldServices.com (the “Site”). This page informs you of our policies regarding the collection, use, and disclosure of Personal Information we receive from users of the Site. 2.1 This policy was created using a template from SEQ Legal (http://www.seqlegal.com) . (g) verify compliance with the terms and conditions governing the use of our website (including monitoring private messages sent through our website private messaging service) . (a) personal data type will be deleted in one year. (c) in order to establish, exercise or defend our legal rights (including providing information to others for the purposes of fraud prevention and reducing credit risk) . (c) in Chrome (version 52) , you can block all cookies by accessing the "Customize and control" menu, and clicking "Settings", "Show advanced settings" and "Content settings", and then selecting "Block sites from setting any data" under the "Cookies" heading. (c) in Chrome (version 52) , you can delete all cookies by accessing the "Customize and control" menu, and clicking "Settings", "Show advanced settings" and "Clear browsing data", and then selecting "Cookies and other site and plug-in data" before clicking "Clear browsing data". 14.1 This website is owned and operated by Select World Services Srl. 14.2 We are registered in Novara, Italy under Partita IVA/ C.F. 07602050721, and our registered office is at Via Fara 24, Novara, NO 28100, Italy. 14.3 Our principal place of business is at Via Fara 24, Novara, NO 28100, Italy. Published by SWS on February, 22nd 2017.